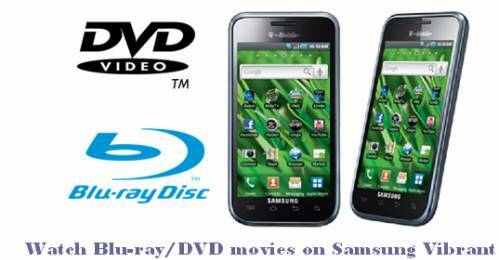 Home » How to watch Blu-ray and DVD movies on Samsung Vibrant? With a vivid 4-inch, 480-by-800 pixel super AMOLED touchscreen, Samsung Vibrant makes everything from hot movies to music videos to Amazon’s bestsellers look absolutely brilliant and clear, even in sunny environments. How to enjoy your beloved Blu-ray/DVD Hollywood blockbusters on the mesmerizing screen of Samsung’s Android-based Galaxy S Vibrant? Take it easy, this guide would offer a solution on how to watch Blu-ray and DVD movies on Samsung Vibrant by using Pavtube Blu-ray DVD to Samsung Vibrant converter, go to see the detailed steps in the following contents. Once run it, click “BD/DVD ROM” or “BD/DVD Folder” to load Blu-ray/DVD movie files, or you can click “IFO/ISO” icon to load your DVD IFO files, or DVD ISO image file. Please notice that the Blu-ray ISO file can only be added to the app via a virtual BD drive. 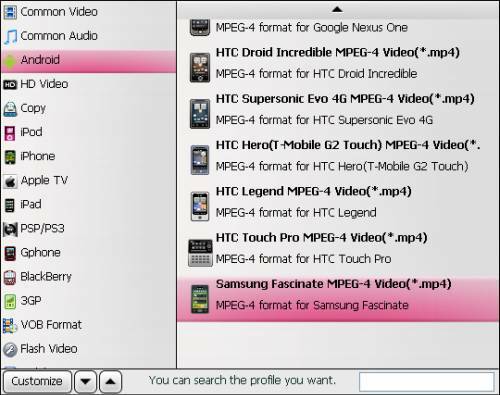 Click on the pull down menu of “Format”, and then follow “Android”> “Samsung Fascinate MPEG-4 Video (*.mp4)”. Samsung Vibrant and Samsung Fascinate both are Samsung’s Android-based Galaxy S smartphones, so the MP4 format specialized for Samsung Fascinate is also playable on Samsung Vibrant. To rip Blu-ray and DVD to Samsung Vibrant, Pavtube Blu-ray DVD to Samsung Vibrant converter allows users customizing the output file quality by adjusting video and audio parameters. Click “Settings” button, then you are able to adjust all the settings in the following popup window, including codec, aspect ratio, bit rate, frame rate, sample rate, and audio channel. 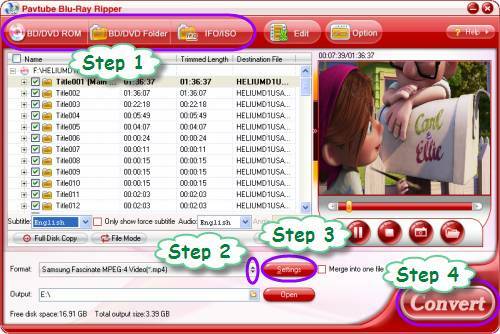 When the above mentioned 3 steps are completed, you can click “Convert” button to rip Blu-ray and DVD to Samsung Vibrant supported file format. Pavtube Blu-ray DVD to Samsung Vibrant converter adopts advanced audio and video synchronization technology, which will never let you encounter troubles caused by audio and video out of sync issues. When the conversion is finished, you can click “Open” button to get the final output files for your Vibrant. Just copy the converted files to the SD card of your Vibrant, and now you are ready to watch Blu-ray and DVD movies on Samsung Vibrant. Make more fun.